Providing you the best range of chopped dehydrated garlic and garlic granules with effective & timely delivery. 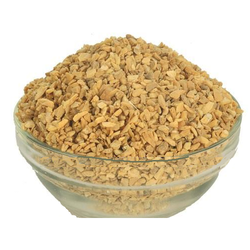 We are a well-known organization that is engaged in offering high quality Dehydrated Garlic Chopped. Our range comes in finely processed finish and can be availed in different packaging choices. The offered garlic also comes with optimum nutritional and medicinal properties and finds use in multiple food recipes. Some of its features include hygienically and finely processed finish, contains anti-oxidants and support detoxifying heavy metals present in the body. Speaking over the outstanding skills of our professional, our firm came up with the Garlic Chopped. Our product is acquired from the renowned and trustworthy vendors in the market. Product is available to meet the growing demand of different clients who focuses on super quality product. We assure that nutritional value of the product is never compromised while undergoing different production phases. 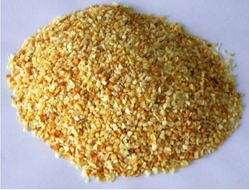 Our company is associated with the most eminent vendors in providing the Garlic Granule. Our product is specially processed for its high demand in the different hotels around the country. Quality measures and standard checks have made it possible to declare it the super quality product. Product is supplied fresh with the essence of purity. Buyers can avail our product at affordable price. Storage: Shall be stored in unopened packing in clean and dry warehouse At ambient temperature 25 c for a maximum period of 12 months.